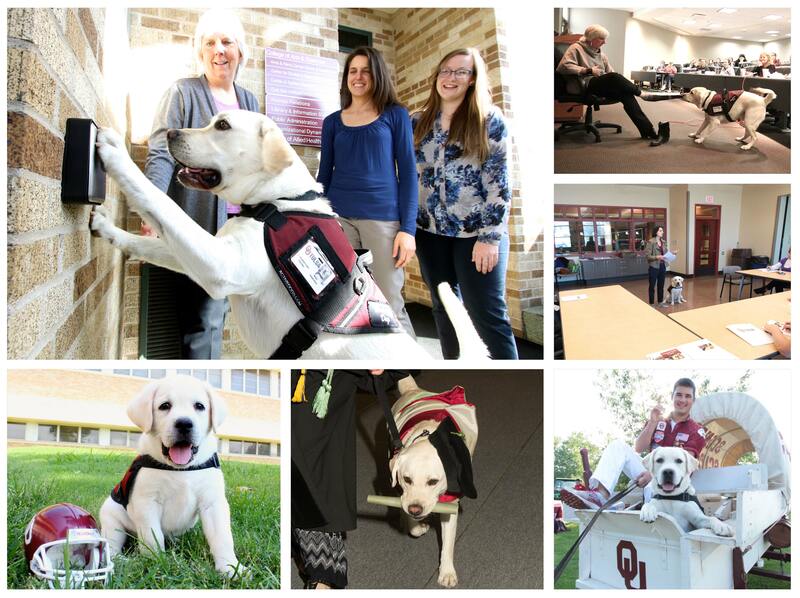 OU-Tulsa has the First Full-Time Canine to Assist in the Learning Process! OU-Tulsa has become an educational leader by being the first university to have a full-time canine to assist with the educational process. Oftentimes, healthcare professionals, students, and potential service dog users do not understand the benefits of service dogs. The lack of knowledge can lead to underutilization of service dogs and create barriers for people who benefit from the use of them. The Professor Paws Project addresses these issues by providing interactive hands-on learning experiences for students, health care professionals, and the community about the benefits of service dogs. The College of Allied Health on the OU-Tulsa campus offers both an occupational and physical therapy degree program. Because service dogs are often a valuable step in the recovery of the patients these students serve, the campus realizes the utilization of service dogs during their college program is an enriching and valuable learning experience for the students. Niko, known as Professor Paws, is a trained service dog who teaches these students about how service dogs can assist future patients - such as opening the refrigerator, turning the light on and off, as well as picking up an item that has dropped on the floor. Additionally, the Professor Paws Project works toward educating the community about the benefits of and laws surrounding service dog partnerships. During the 2018-2019 academic year, Professor Paws will expand further to include presentations to middle and high school students in the Tulsa area. These school presentations will be conducted by OU-Tulsa College of Allied Health students, in partnership with Niko, and will focus on the benefits of service dogs. The presentations will also include information on occupational and physical therapy for students to consider as future careers. Please click on the video above for more information on the Professor Paws Project. Your contribution will support the Professor Paws Project during the 2018-2019 academic year. Funds generated through this campaign will assist with direct program costs, including canine meals, care, training, as well as program materials, travel costs and student expenses. All contributions are tax-deductible and directly benefit Professor Paws — every gift counts! You can help promote this campaign by sharing our message on social media, emailing your friends and family, and talking to your colleagues. We believe that together we can make a difference in the lives of OU-Tulsa students and those served through the Professor Paws Project. Thank you for your commitment to OU-Tulsa and the Professor Paws Project. Your investment not only impacts the lives of our students today, but also those who can directly benefit from service dogs. Help Professor Paws take the first steps to educate OU-Tulsa students about service dogs. You can help underwrite the cost of Professor Paws meals for one week. Your support will assist with the care and upkeep of Professor Paws himself. Your gift will underwrite the annual cost of training supplies for Professor Paws. Be an advocate for Professor Paws by covering the cost of the program’s printed materials for one year. Provide vital assistance to underwrite the cost of Professor Paws training for one year. You are a Top Dog for sponsoring Professor Paws community presentations for one year. Your support helps underwrite the cost for OU-Tulsa students and Professor Paws to educate others in the community about service dogs and how they can assist people!